After practising for six to nine months we should get better and reach Level II. This is “Two Yin and eight Yang, normal level 二陰八陽是散手”. If we really practise then our bodies will become a bit softer and become two Yin and eight Yang. This means 20% Yin and 80% Yang which is a bit better. Normally whatever we do, the more we practise the better we become. 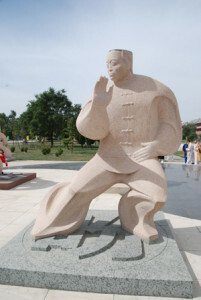 However Taijiquan 太極拳 is different. We cannot just practise by ourselves we also need a good teacher to help correct us. I once came across someone who had bought a book on Taijiquan and had taught themselves for about five years. He came to show me his form to ask me if it was good or not. After the first few movements I told him to stop and that he would be better off leaning it properly from the beginning. He was upset and I never saw him again. I think he thought he was quite good and wanted me to tell him so, but it was just the opposite and he was very disappointed. Facing the truth is hard, so he will never become a Taiji master.